Williams Funeral Home was established by Thomas F. and Hannah Williams in August 1935. The funeral home originally was located at 401 West Seventh Street in Columbia. In 1946 the Williams Family purchased Irwin Brothers Funeral Home in Mt. Pleasant. After this purchase this business was moved from North Main Street, in Mt. Pleasant to the Jackson - Killebrew House on Pleasant Street. In 1952 the Columbia Funeral Home moved from 401 West 7th. Street to 400 West 7th. Street where it remained until January 1961 when the business moved to the Mt. Pleasant Pike in Columbia. In 1961 the Columbia location was constructed to have multiple uses. Its primary use of coarse the funeral home itself however like many funeral homes in that era it was also used at the ambulance service head quarters. Being during the cold war era it was constructed as a bomb shelter with a basement 16 feet underground with heavy pre-stressed concrete. Upon the retirement of the Williams family, the business was purchased by the Blevins family in 1982. Also in the mid- eighties Alan aquired a local cemetery, Polk Memorial Gardens. Polk continues to make changes in order to serve our families. Some of these changes involve history for instance, Polk has the only statue of James K. Polk in our county. Another major change is the addition of the Arbors, a park like area with the second largest pavilion in the state of Tennessee that sits beside a lake. There would be many upgrades as well as remodels in the almost 50 years that we inhabited that building and called it home. Most of them taking place after the Blevins family purchased it. The trotwood location was very much considered home to all of us. 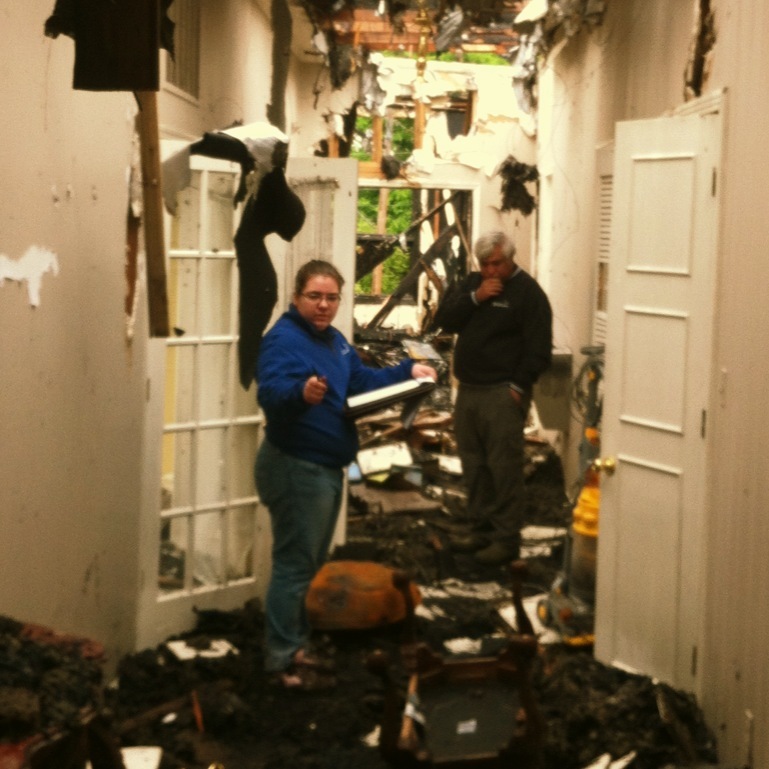 On April 17, 2012, the Williams family suffered a tragic fire that destroyed most of the building, however because of the bomb shelter like construction the down stairs of the building mostly survived protecting all of the files as well as many other precious items. 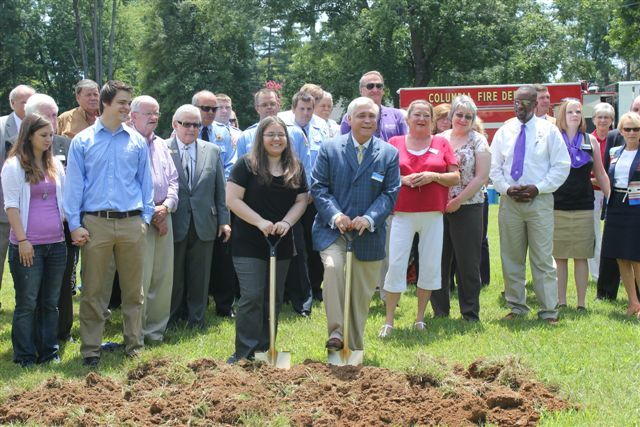 On April 17, 2013, The Blevins Family reopened Williams Funeral Home. The new facility can be seen by clicking here. Alan Blevins has been a licensed funeral director and embalmer for over 36 years, holding a license in Arkansas and Tennessee. He grew up in Mountain Home, Arkansas and attended the University of Arkansas before receiving a scholarship to the Dallas Institute of Mortuary Science where he was Valedictorian of his graduating class. He is a member of Pi Sigma Eta Scholastic Fraternity. Alan purchased Williams Funeral Home, Columbia and Mt. Pleasant, TN, from the Williams family in 1982. Under his leadership, the Williams Funeral Home operation has expanded to include an on-site crematory, Polk Memorial Gardens, Pinecrest Memorial Gardens, Cemetery Memorials of Tennessee and Family PALS, the pet and animal loss division of Williams Funeral Homes and Crematory. Alan has served on various boards and charities in Columbia and has been elected as secretary/treasurer and two terms as president of the Cemetery Association of Tennessee and now serves as the President of the Southern Cemetery, Cremation and Funeral Association. Alan resides in Columbia, TN and has two children, Lauren Ashley and John Alan. He enjoys golfing, fishing and spending time with his family. Lauren loves to look for new ways to serve families, and because of that, she has recently become a Certified Celebrant as well as a certified crematory operator. In 2013 she completed her Master's degree in business from Trevecca Nazarene University. Lauren is a current member of the board of directors for the International Cemetery, Cremation, and Funeral Association (ICCFA), the Southern Cemetery, Cremation, and Funeral Association (SCCFA), the Cemetery Association of Tennessee (C.A.T), the United Way Board of Maury County, The Youth Educational Foundation and The Maury Alliance. She also holds the title of Certified Cemetery and Funeral Executive issued by the ICCFA. John Alan Blevins was born and raised in Columbia, TN. He attended Zion Christian Academy from Preschool until graduation in 2007. Following high school he attended Lee University and later transferred to the University of Tennessee Knoxville graduating in the spring of 2012 earning a Bachelors of Arts in Psychology. After spending 7 years he married the love of his life Ashlyn White Blevins, July of 2013. John obtained his Funeral Director's license after years of watching his father care for others during the most trying of times, he felt that he would be able to carry on his father’s care and compassion for those in need. Kerry Wayne Boshers was born and raised in Mt. Pleasant, and a 2007 graduate of Hampshire Unit School. He is a licensed funeral director with Williams Funeral Home. He graduated from John A. Gupton College in Nashville in December of 2012. After working with the public in Mt. Pleasant as a night shift manager during high school, spending his time assisting the public is something he wanted to pursue as a career. The loss of his friend, Ashley, in a tragic automobile accident, helped him decide that planning funerals for people and easing the burden of loss would be most suitable for him. Assisting families, celebrating lives with their loved ones, and generating the amount service you expect when you come to Williams are just a few of his goals while working with his Williams Family. He is the son of Angie Carroll Boshers, brother to Brandy Cothran & Daniel Boshers, and uncle to Jeffery Ryan Cothran & William Ray Lance Cothran. In his spare time, he enjoys traveling, movies, music, and spending time with his family & closest friends. Kerry is a licensed funeral director, licensed crematory operator, certified celebrant and a licensed pre-need family service counselor. A native of Muncie IN, Jerry Strahan graduated with a bachelors degree in Psychology from Ball State University. He served with the Indiana National Guard 151st Rangers as an infantry paratrooper and medic... Airborne! As a member of Grace Nazarene Church, Columbia TN, he has served as a board member, Sunday School teacher, and currently serves on the building committee. He is a past president of the Zion Christian Academy PTO. He and his wife, Rebecca, have owned a graphic arts business in Columbia since 1989. He retired with 38 years service from GM in 2004. The proud father of two sons; Matthew and Joshua, he most enjoys spending time with his wife and family. Jessica Clawson was born and raised in Columbia, TN. She attended Columbia Central High School and graduated in 2010. A year later, she found her interest in Mortuary Science. She attended John A Gupton and graduated in December 2015. Jessica is a licensed Funeral Director and Embalmer. Jessica is the daughter of Rick & Beth Clawson of Columbia. She is a member of The First Family, First Baptist Church. Jessica likes to spend her free time with her family and friends. She loves racing, four wheeling and the outdoors. She is a proud mother to two beautiful daughters, Chassity, the mother of her granddaughter amazing granddaughter, Abigail, and Chelsea, the mother of her wonderful grandson, Carter. She is the daughter of Orville and Brenda Lindsey of Culleoka. She loves to worship, and is active in her church, Central Christian. Bob Miller has currently resided in Maury County for 17 years. He and his wife of 49 years are the proud parents of 7 children, 18 grandchildren and 10 great grandchildren. Bob is very active at Grace Church of Nazarene church where he served as Church Secretary, Sunday School Superintendent, and served on the Board for 16 years. He started the "First Impressions" ministry and continues to serve in that ministry, as well as being a small group leader. After the tragic loss of a 16 year old daughter in an automobile accident, he has the desire and compassion to help others through their loss. Shirley Spears was born and raised in Columbia. She moved to Mt. Pleasant in 2004. Shirley is the mother of two children, Briana and Kaleb Haywood, and Briana has given her 4 grandchildren Brogan, Rheagan, Talon, and Kelon. Shirley loved working on new projects outside and tending her flowers. She also loves cooking for large crowds and catering events. Shirley is well respected and beloved at Williams Funeral Home and was also the recipient of The Dove Award in 2012 from Alan & Lauren Blevins. The Dove Award is given out to a Williams Employee who puts others before themselves, shows outstanding character, and is always there helping. Delana Lindsey was born and raised in Columbia, TN. After moving to and living in southern Kentucky for some 12+ years she has come back home to beautiful Middle Tennessee. She is a Columbia Central High School graduate and the daughter of Orville and Brenda Lindsey. She has 5 nieces, 4 nephews, 1 great-niece & 1 great-nephew. Office administration has always been Delana’s job of choice. However, she was also a live-in nanny for a family in Kentucky for 5 years. She has a heart for children and a desire to help others. Since beginning her position with Williams Funeral Home, at Pinecrest Memorial Gardens, she has learned so much and met so many wonderful folks! Delana’s hope for the future is to continue to learn and strive for continued improvements at Pinecrest. Bob Vassar was born in Huntsville, Alabama. After graduating from Lee High School he attended the University of Alabama in Huntsville then transferred to Samford University in Birmingham, AL where he received his BA degree with a major in religion and minor in sociology. In 1980 he received the Master of Divinity Degree from The Southern Baptist Theological Seminary in Louisville, KY. He and his wife Lisa moved to Columbia, TN in 1992. They have three daughters, Mary (Josh), Taylor, Sara Vassar and Rachel Vassar and two grandsons, Jackson and Austin Taylor. Bob is the retired Sr. Pastor of Pleasant Heights Baptist Church having been given the honorary title of Pastor Emeritus of the Church on December 31, 2014. Jack was born and raised in East Tennessee. Moved to Columbia in 1975 starting a new business with his wife Bobbie. They work in their Towncraft Cookware Business for almost 40 years. Jack and Bobbie were married 50 years before her passing in December 2013. Proud parents of one daughter (Deana) and two grandchildren. I am a member of the Pleasant Heights Baptist Church and also sings the choir. Started working at the Funeral Home in May 2014 after Bobbies passing. I love meeting people and helping them through their time of grief. I just love people. Barbara was born and raised in Columbia, TN. Married to Billy Garland. She is the mother of three children. She worked at General Electric in Columbia for 19 years and in Louisville, KY for 3 years. She stayed in Louisville for 17 years before moving back in 2011. She is a member of the Cumberland Presbyterian Church. Jane Jones was born in the Sawdust Community and raised in Maury County. She has lived in Mt. Pleasant for the last 42 years. Jane works full time at Maury Regional Medical Center and has been a funeral assistant for the last 21 years for the Williams Funeral Home family. Jane loves working in her yard and raising flowers. She attends the Mt. Nebo Methodist Church. She is the mother of three children, Byron (Connie) Jones of Mt. Pleasant, Kimpy (Bill) Collins of Franklin and Garrick Jones of Mt. Pleasant. Jane has two children, Ryan Holtsford of Franklin who attends Middle Tennessee State University in Murfreesboro and Katelyn Jones of Mt. Pleasant who is a senior at Mt. Pleasant High School. Frank was born in Ancon, Canal Zone, Panama and now calls Mt. Pleasant home. He and his wife Brenda, of 41 years have two children; a daughter Christy who went home to be with the Lord when she was 18 years old; and a son Matthew, who is 33 who also lives in Mt. Pleasant. He has 3 grandchildren; Faith, Adreanna, and Hunter. Frank spent 8 1/2 years in the U.S. Airforce and 18 years in the Federal Aviation Administration and retired as an Air Traffic Controller. He is currently the Pastor of Faith Community Chruch in Mt. Pleasant. He got involved with Williams Funeral Home because of a desire to help those in a time of grief. I am a Williams Funeral Home assistant, helping families in every possible way that I can. I have lived all my life in Mt. Pleasant. Robert and Sue were my parents they had eight children and I am the fourth. I served in the military for three years in Hawaii. In 1965 I married Mary Ann Lane and we have one daughter Kim (Jay) Baker, two grandsons Wesley and Corey and one great-granddaughter Bynlee Baker. I am a member of Allensville Baptist church and serve as a deacon. I love serving my Lord, and spending time with my family and helping others. Oh yes! And I love fishing, if anybody wants to take me! Donna Whitley was born and raised in Columbia, TN. She attended Columbia Central High School. She is the proud mother of 3 children: Misty, Josh and Jonathan, and now that her children are grown she has 5 wonderful grandchildren: Jacob, Ashlynn, Jaxon, Emma and Brooklyn. She also has a dog named Molly. Donna loves spending time with her family. She attends church at House of Prayer Baptist Church and has since she was 14 years old. She is very active in the little country church, teaching Sunday School there since she was 20 years old. Donna loves teaching the children, watching them grow up and then teaching their children. She also sings in a group with her sisters: Betty, Tricia and Debra they call themselves "The Kelley Family". Donna has always played the piano at church, but only by ear, she will openly tell you she doesn't know the first note. She also writes and organizes all of the Vacation Bible Schools and festivals the church puts on. Donna has always worked in management, and also used to be the Greyhound Bus Lines agent here in Columbia for years. Her hobbies were walking , watching movies and going fishing. She believes in God with all of her heart. Donna believes that God gave her a purpose here on earth, and that is to be able to talk with people and help them in their time of need. She always tries to make sure that she treats others the way they want to be treated. Ernest M. “Monty” Gilliam was born on March 24, 1944 to Thomas A. Gilliam and Grace Carpenter Gilliam at King’s Daughters Hospital, in Columbia, Tennessee. Monty was a special boy from his early years and loved to tell stories from his younger years, especially relating to his boyhood school friends. His father, Thomas, was a hard worker and taught Monty the value of working hard to provide for his family. Monty was a dutiful son all the years of his mother’s life, insuring that Mrs. Gilliam was always cared for in any way needed. When Laura Jo Bobo was just 17 years old, she met a young man who was to become the love of her life, Monty Gilliam. They shared many things in common, among them their faith, singing, love of family and most of all their love for each other. They married on May 24, 1970 and all the days of their marriage, Laura recounts that he was a wonderful, loving, faithful husband and a man of integrity. They taught Beginner’s Sunday School Class at 1st Assembly of God Church for over thirty years. He was a man who truly loved God and always served Him and loved people. Laura and he were a perfect match, because they served the Lord together all the days of their married life. Anyone who knew Monty knew how much he loved and treasured Laura, his “Sweetie”. Monty also loved his community deeply, and was proud of his connections to it. He was a very proud member of the 1962 Class of Columbia Central High School. This was the very 1st class to graduate from the new school on what is now known as Lion Parkway. He was so proud to know that yet another new school is finally to be built for future students of Maury County. Additionally, Monty was an Ambassador for the Maury County Chamber and Economic Alliance for the past eleven years. He was honored as the Ambassador of the Year for 2014 for his work in representing our great community and his work in promoting business growth. He was also the Ambassador of the Month many times during his eleven years of service. Mr. Gilliam was also a vital member of the Williams Funeral Home staff for many years, serving as a funeral director’s assistant. Most recently he oversaw the daily operations of Family Pals (Pet and Animal Loss Service) division of the company, bringing caring and compassion to many families who had experienced the death of a beloved family pet. Monty’s career at Williams actually began when the two local funeral homes operated the ambulance service for the community. He enjoyed relating his experiences driving the hearse as an ambulance and providing care to the community he loved so dearly. He was a plethora of knowledge regarding the history of funeral care in Maury County. He also collected die cast models of antique hearses and ambulances in honor and remembrance of those wonderful days of his younger years. Another of Monty’s loves were “his boys” the Royal Rangers, at First Assembly of God in Columbia, as well as the Tennessee District. He loved teaching those young boys about Jesus, and providing a fun atmosphere for them to learn. The Rangers teach boys about Jesus as well as real-world scouting type skills that they can use in their lives as grown men. He loved that some of his boys were able to turn the Ranger experience into college scholarships and even begin working with the Rangers themselves upon reaching manhood. Many lives were touched by Monty’s ministry. Monty and Laura loved to travel together every chance they got. He was an avid Southern Gospel music fan, and surprisingly to many who knew him, he also loved Dixieland jazz and other types of music. Being a Southern Gospel music fan, it was fitting that he was a member of the Southern Gospel Music Association. He made many friends over the years in his work as a radio announcer and advertising salesperson for WXRQ radio. He attended the Southern Gospel Radio Convention annually making friends and meeting many world famous Southern Gospel musicians and entertainers. Many people in the Maury County area were blessed by Monty’s work at the radio station, bringing hope and encouragement through music into their homes and cars. He loved collecting marbles, knives, die cast cars and western memorabilia. Monty was known around town for serving as “Uncle Sam” for patriotic events and loved giving treats to folks on Memorial Day at Polk Memorial Garden’s annual celebration that were Made in USA. Mr. Monty Gilliam passed away on Thursday, June 25, 2015 with his loving wife by his side, at his residence in Columbia, Tennessee. Mary Louise "Duby" Beckum was born and raised in Mt. Pleasant and has lived there all of her life. She is a graduate of Hay Long High School. Before coming to Williams Funeral Home in 1996, Duby worked for Wright's Pharmacy in Mt. Pleasant for 20 years and Lumpy's Malt Shop, also located in Mt. Pleasant. Duby is the mother of two children, Donna Pugh and Christopher (Becky) Beckum and the grandmother of five, Dereck Pugh, Levi Pugh, Kendall Pugh, Anthony Morales and Christian Beckum and five great-grandchildren. She is a member of the Mt. Pleasant First United Methodist Church, Mt. Pleasant Lion's Club and the Maury County Business Women. Our sweet friend and Williams Family member for over 17 years, went to be with her Lord on April 2, 2015. She will forever be a part of the Williams Funeral Home history.